Energy is humanity’s need after air, water, food and shelter. As a matter of fact, energy is required even to supply clean water,process and cook food and create shelter. Hence it becomes a basic need of human beings. Energy Security means safety and protection of energy availability to all at all times. Utilizable energy potential is limited on earth while its requirement would go up with the growing population. Energy access in its environmentally benign form is an essential part of energy security. Non-renewable energy dominates the world consumption today at 81%. Renewable energy supplies 19% of global energy consumption counting traditional biomass, large hydropower, and “new” renewables (small hydro, modern biomass, wind, solar, geothermal, and bio-fuels). Of this traditional biomass, used primarily for cooking and heating, accounts for approximately 13%.Hydropower represents 3.2%. Other renewables account for 2.8%. According to one estimate, with the present rate of consumption, world is left with approx. 200 years of coal, 75 years of nuclear fuel, 50 years of gas and 25 years of oil respectively. World energy-related carbon dioxide emissions are of the order of 33 billion metric tons. Fossil fuel plants (≃ 50,000) are largely accountable for carbon emissions contributing to nearly 60% of global warming. Sulphur content in coal causes acid rain which spoils the crops. Natural gas is less carbon-intensive than other fossil fuels. Worldwide smoke from biomass burning causes 1.3 million deaths besides 1.6 million from associated tuberculosis every year. Nuclear energy, though carbon free, has a risk of accidents causing radioactive hazards. Nuclear accidents from Three Mile Island in the United States (1979), the Chernobyl disaster in the USSR (1986) to the Fukushima nuclear disaster in Japan (2011) are compelling advanced nations like US, Australia, New Zeeland, Japan, Sweden and Germany to phase out their nuclear plants in favor of natural gas and renewable energy. While sun is the infinite source of energy (reflected in several indirect forms also like hydrological cycle, wind, biomass etc.) its utilizable potential is finite on our planet on one hand and fossil fuels have a limited stock on the other. Renewable sources are seasonal & intermittent in nature and therefore need energy storage complements. This throws a challenge for a global vision on securing energy in a sustainable manner for present and future generations. For electricity component of energy the present and future scene appear as in the table above. 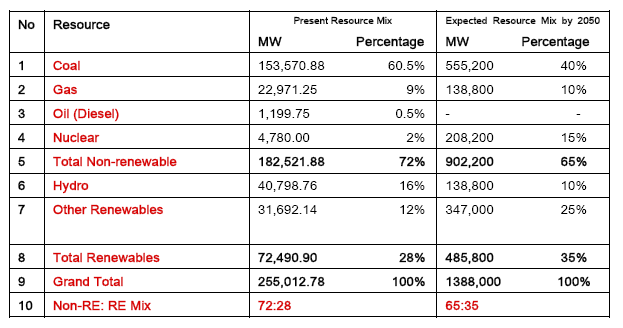 In Indian context, the utilizable potentials are: Solar-5×1015 kWh/yr., Hydro-300,000 (150,000 Conventional + 90,000 Pumped Storage + 10,000 Tidal + 20,000 Small Hydro + 30,000 Interlinking of Rivers) MW, Wind-231,000 MW including offshore, Biomass- 20,000 MW, Coal-250 billion tonnes, Coal Bed Methane-20,000 MW, Oil-125 Million metric tonnes, Natural Gas- 1,437 billion cubic metres, Shale gas-600 to 2000 Tcf, Uranium-49,000 tonnes, Thorium-846,477 tonnes, Geo-thermal-10,600 MW, Ocean thermal-50,000 MW, Sea wave power-20,000 MW, Energy from Waste-3000 MW and Energy Saving potential-25,000 MW. When it comes to a national strategy, dependence on imports will have to be minimized in favor of indigenous renewable sources.Rest is techno-economic feasibility. India is responsible for 5.3% of world CO2 emissions. She is importing thermal coal from Indonesia and South Africa. Several nuclear accidents have occurred in India costing 910 million US$ for repairs besides long shutdowns and radioactive releases affecting thousands of people. For India’s energy security, dependence on import of technology and fuel (uranium) adds another negative dimension. Indian mining operations are inadequate both for Biotic and Abiotic resources. Electricity is the environmentally cleanest form of energy at user’s end and is therefore sought after to the largest extent. Barring furnaces, boilers, cooking gas and biomass, solar thermal and transportation sector, almost everywhere it is electricity. India generates 1,100 BU of electricity in a year out of 21,000 BU in the world, being 3rd largest producer after China and United States. Yet out of 1.25 billion, 400 million Indian citizens have no access to electricity. Per capita consumption in India is 917 kWh against worldwide per capita annual average of 2,600 kWh.Expected growth, resource mix etc. by 2050 are shown in the table above. Per capita consumption of energy is growing continuously in India. Present electricity deficit being around 10%. Nuclear, thermal (coal), oil and gas power plants partly depend on imports for their fuel. National energy security can come from indigenous and everlasting sources like Hydro and other renewables viz. Wind and Solar. Hydro has always been cheaper than other options and Wind and Solar are reaching grid parity. Wind tariffs are already comparable to tariffs related to imported coal. It would be desirable to change the projected Non-RE : RE Mix in favor of renewable energy in a foreseeable future. Energy security of a nation does not merely mean fulfilling the needs of all by imports of non-renewable sources like coal, oil, gas and uranium but to consistently removing dependence on such fuels and developing indigenous renewable sources such as hydro, wind and solar. This has key to global energy security also. Low carbon pathways will mitigate global warming and climate change.